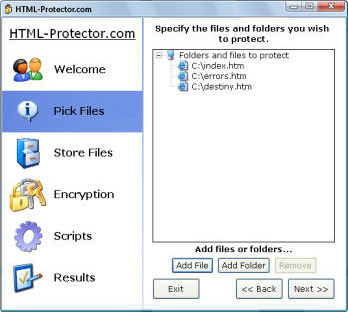 HTML Protector - Protect HTML Source Code, Protecting Website HTML Code - CLICK! Hide PayPal Return Links, Break Out of Frames & MORE! PLUS: Order Today & Receive $50 Discount AND 8 Free Webmaster Tools! If you don't protect your Web site, your entire BUSINESS is at risk of being STOLEN! Seriously. Do you know how easy it is for ANYONE to steal data from your site right now? • STEALING your PayPal downloads "return link" is as easy as clicking View > Page Source! • EVEN the world's dumbest Webmaster can frame your pages, so they look like his own! ... And that's just the beginning. Your Web site is at risk. And you need PROTECTION! 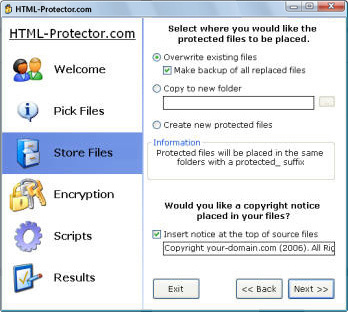 HTML-Protector 2019 keeps your site PROTECTED. Full stop! It doesn't matter what sort of Web host you use, or what hosting package you have. 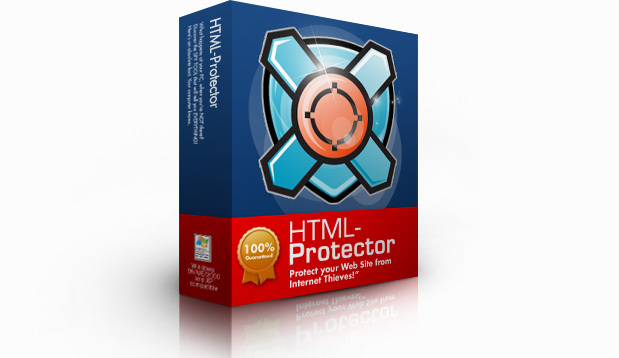 HTML-Protector 2019 will protect HTML on absolutely ANY Web site. Simply launch HTML-Protector, choose your Web site files, select your protection options – and you're done. It's literally that easy, with HTML-Protector 2019! In Just FIVE MINUTES from Now, with HTML-Protector! many features, offering total online protection – with just a couple of clicks! Encrypt your HTML, so NOBODY can view your original source code. No special software required. Just point, click and protect! Instantly encrypt all of your e-mail links – and kill those "spam spiders!" Prompt for a password before accessing a page. Works with ANY Web host! Force Web pages to display ONLY on your Web site. Nowhere else! 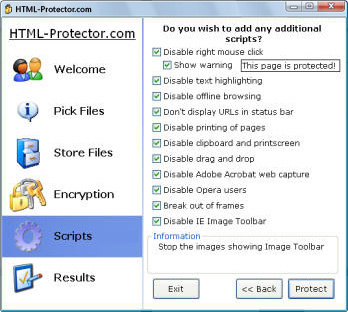 HTML-Protector will disable the menus, block the Image Toolbar & more! Stop text highlighting, right-clicking, printing, offline browsing – and more! Ensure that users only see what you want them to see. Protect your site! Stop other sites framing and impersonating with your pages. Break out! Block certain browsers, disable the clipboard, insert copyright warnings & more! Interested? Click here to purchase your copy. And the PROOF that HTML-Protector REALLY Works!! typically HTML pages on your hard drive. or put the new encrypted files in another folder. Select to encrypt the whole page, or just the e-mail links. What other protection would you like? protected your pages. It's that simple! Want to see PROOF that HTML-Protector 2019 really works? Simply click here to open our test page. The password to open the page is "test" – and we've purposely blocked Opera, Netscape and Firefox users. Open the page and try your best to hack it! HTML-Protector 2019 is absolutely the ONLY program you'll need to keep your entire Web site safe from Internet thieves. Click HERE to download your copy today. Want to PROTECT Your Site – ONCE and for ALL? Plus Save $50 & Get 8 Great Bonus Tools – FOR FREE! Interested in protecting your site – starting just FIVE MINUTES from now? There's NEVER been a better time to grab your copy of HTML-Protector 2019! For a limited time only, we're offering a $50 discount on our RRP of $68.95. That means you can grab your copy of HTML-Protector 2019 TODAY for the tiny price of just $18.95 -- with FREE LIFETIME UPGRADES! Not only that, we're also throwing in EIGHT BONUS WEBMASTER TOOLS when you order BEFORE midnight, Monday, January 28th 2019. These amazing Webmaster tools include the PayPal PayLock Generator, HTML Compressor and HTML Remover – and have a combined value of $195! That means when you purchase HTML-Protector 2019 today, you'll receive over $250 in great Webmaster tools – FOR JUST $18.95! ... for the special offer price of JUST $18.95! Approximately £11.95 or 13.95 Euros. Price converted to your local currency. BONUS: Buy TODAY and you'll receive 8 FREE webmaster tools with your download, including the PayPal PayLock Generator, HTML Compressor and HTML Remover! Download link sent within minutes by e-mail. To download the trial version of HTML-Protector, please click here.